Below I have descriptions of the three presentations followed by links to view the video and presentation materials. Despite using a tripod, the video is a little shaky at times. This is due to my novicity (I’ve decided that’s a word [No, it’s not. –The Copy Editor]) when it comes to video taping presentations in low light. Also, I was holding a beer in my free hand. A side note: While it is standard practice in writing to refer to people by only their last names after first introducing them, I’ve decided that this is a very un-Eugenian practice, and I don’t want to follow it anymore unless it’s necessary for clarity. From now on, we are on a first-name basis on this blog (except for me, because I treat my last name like my first name). The first presenter was former ODOT State Traffic Engineer Ed Fischer presenting the International Scan on Pedestrian and Bicyclist Safety and Mobility. For this project he traveled all over Europe where his team learned a lot about what other countries were doing to encourage walking and biking, and saw which infrastructure, attitudes, and policies worked or didn’t work. 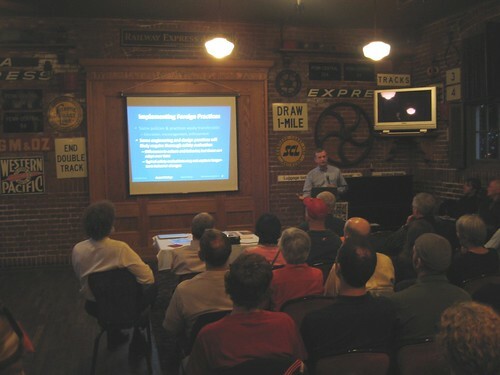 The next presentation was by Hugh Prichard, retired 4J school teacher (soon we all will be) and real estate developer. He’s been on several bicycling tours to Copenhagen, and compared the experience of cycling there to cycling in Eugene. His presentation starts off with a pretty amazing slide show of where we could one day be ourselves. The third presenter was Jessica Roberts of Portland-based Alta Planning + Design. Alta Planning + Design are currently working with the City of Eugene to develop their Pedestrian and Bicycle Master Plan. Her presentation, titled “Home Grown Innovations,” illustrated all the great things that are happening in Portland and Eugene to promote cycling, and assessed their success. Jessica provides a great description in her presentation of the appropriate use of sharrows and bike boulevards, a topic that has generated some controversy in the past.